Hannibal ad portas – a phrase that not only exemplified what an entire generation of Romans went through, but also reverberated into popular consciousness during the later years of crisis faced by the Roman Empire. Simply meaning ‘Hannibal is at the gates’, it was an adage used by parents who wanted to scare their children at night. And in more crucial scenarios, it was even used as a desperate rallying cry that reminded Romans of their hardships in the late 3rd century BC. The character in this phrase obviously pertains to Hannibal Barca, arguably Rome’s greatest adversary and the realm’s eternal ‘bogeyman’ – who surely was the greatest military general of his entire generation. So without further ado, let us check out ten fascinating facts you probably didn’t know about Hannibal. Like father, like son. Hamilcar Barca – Hannibal’s father, was the leading Carthaginian general during the First Punic War. He commanded the Carthaginian land forces in Sicily from 247 BC to 241 BC, during the latter stages of the conflict; and as such, was pretty successful in mounting localized guerrilla-inspired raids until the Carthaginians were forced to retire from the island. 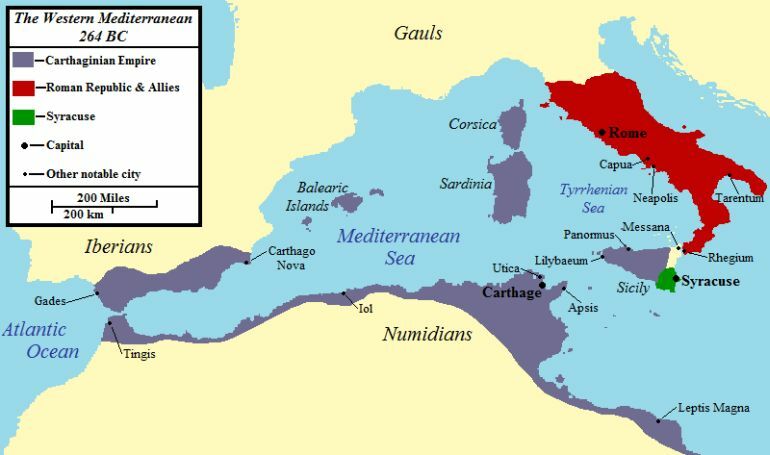 More importantly, Hamilcar was instrumental in carving out the ‘newer’ overseas territories of Carthage in Iberia (Spain) by expanding upon her initial dominions. Suffice it to say, Hamilcar was known for his dynamic initiatives on military campaigns – with one incident even involving a lightning fast raid inside the southern part of mainland Italy. [which] burst its way through the midst of the Alps and swooped down upon Italy from those snows of fabulous heights like a missile hurled from the sky. 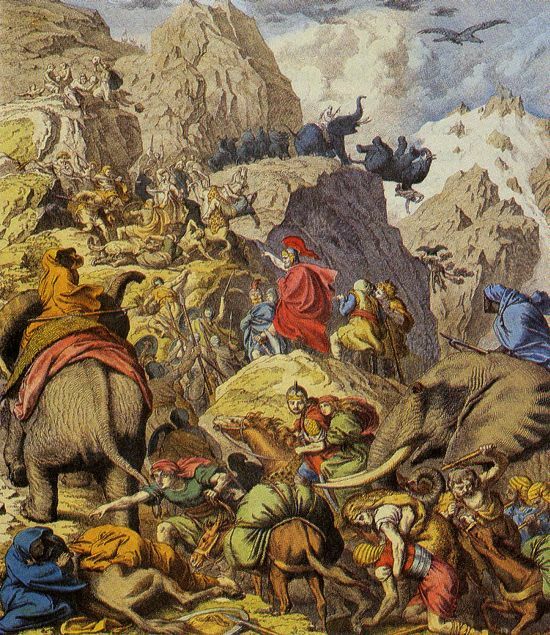 Hannibal’s crossing of the Alps in 218 BC is often viewed as a military action that is tantamount to daredevilry on a large scale. But while risks were surely involved in the endeavor, the ‘audacity’ of the scope was fairly well planned by Hannibal. Simply put, the crossing was not just tried and accomplished purely for the ‘shock and awe’ factor that would psychologically afflict the Romans. There was a deep strategic side to the entire affair, and the Carthaginian general precisely weighed his option and then decided to go for the calculated risk. Obviously this entailed years of planning, with the original scheme of crossing the Alps sometimes even attributed to Hannibal’s brother-in-law Hasdrubal the Fair (or possibly his father Hamilcar) – who commanded the Carthaginian forces in Spain from 229 BC. And if the latter case is true, then the Romans themselves might have known about this grandiose plan, and perhaps were even relieved when Hasdrubal was assassinated by a Celtic mercenary in 221 BC. Alexander was known for his self-assurance, Hannibal for his personality. Livy attests to the latter’s leadership skills by mentioning how Hannibal managed to not only control his mercenary army (which had been described as ‘a hotch-potch of the riff-raff of all nationalities’), but went on to win victories over the Roman forces for fifteen straight years – and that too within the confines of Italy. The irony in this case related to how the same folks who fought for money and plunder, grouped together to forego such things in favor of innumerable hardships for their chosen leader. This certainly speaks highly of the potent charisma demonstrated by Hannibal all throughout these rigorous years spent in a foreign land. However beyond just charisma, there must have been a more intrinsic sensitive side to his ‘management skills’. Literary evidences point out how Hannibal slept alongside the ordinary soldiers out in the cold open; he even went hungry along with his soldiers when the supplies ran low. But more importantly, the soldiers (despite their different origins) placed their utmost trust on their Carthaginian commander when it came to actual battles. Simply put, they acknowledged and followed the directives of their general – mostly without question, due to their collective belief in the prodigious generalship of Hannibal. 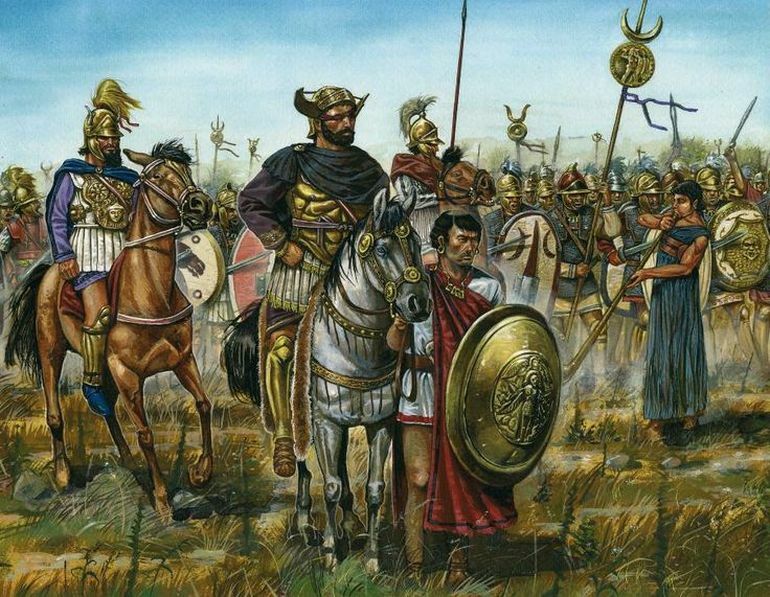 Circa the later period of 3rd century BC, the Romans were known for their organized ranks of maniples (read more here) comprising what can be technically termed as heavy infantrymen. As a result, their battlefield tactic was spectacularly simple – as it often entailed countering the enemy forces (who were mostly disordered) with sheer discipline and rotation of manpower on the field itself. Hannibal formulated a plan against these seemingly invulnerable formation-based armies by inducting highly trained light troops into the ‘rag-tag’ Carthaginian army, especially from Spain and Africa. One example would pertain to incorporation of Balearic slingers who were known for their expertise in accuracy over various ranges (which encompassed the use of three different types of slings!). In fact, their effectiveness was so aptly demonstrated against the Romans that even conventional archers were eschewed in favor of these lightly armed mercenaries. 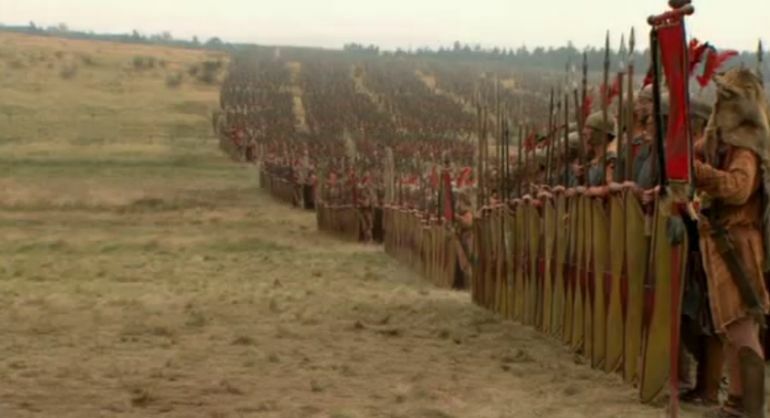 And since we brought up the scope of effectiveness, very few units showcased their on-field efficacy against the tightly packed Romans as the Numidian riders armed with only javelins. Espousing daredevilry on horseback, they probably rode without reins – instead using just a rope around the horse’s neck and a small stick to give it commands. In many cases (like at the Battle of Trebbia), Hannibal utilized their nigh-perfected mobility and zig-zag maneuvering ability to draw the attention (and ire) of the Romans. Such skirmishing tactics, often mixed with vocal insults, in turn forced the roused Roman to give battle even when they were under-prepared. 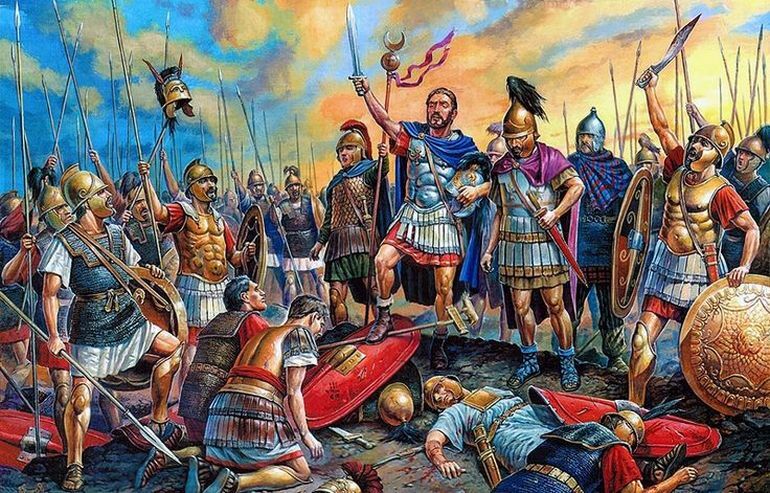 Much has been said about the Battle of Cannae – an encounter which had resulted in the highest loss of human life in a single day in any battle recorded in history. 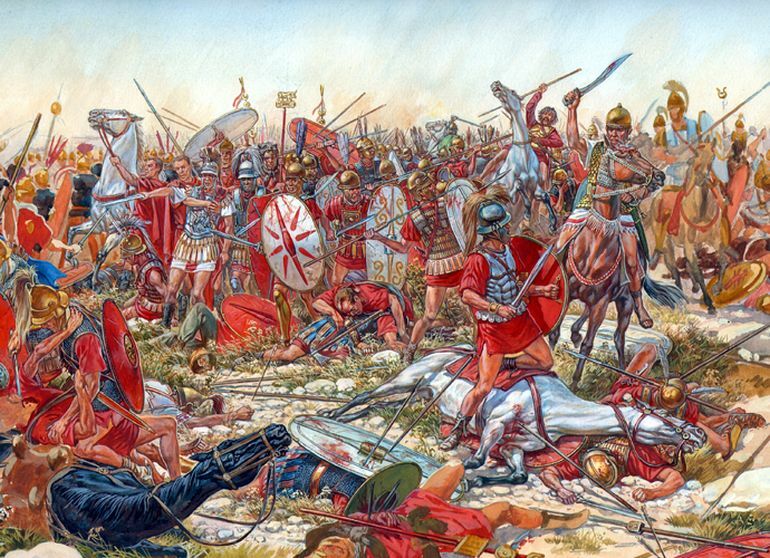 In terms of sheer numbers, the bloody day probably accounted for over 40,000 Roman deaths (the figure is put at 55,000 by Livy; and 70,000 by Polybius), which equated to about 80 percent of the Roman army fielded in the battle! To put things into perspective, the worst day in the history of the British Army usually pertains to the first day of the Battle of the Somme in 1916, where they lost around 20,000 men. But the male population of Rome in 216 BC is estimated to be around 400,000 (thus the Battle of Cannae possibly took away around 1/10th – 1/20th of Roman male population, considering there were also allied Italic casualties), while Britain had a population of around 41,608,791 (41 million) at the beginning of 1901, with half of them expected to be males. However objectively beyond just baleful numbers, the encounter in itself was a set-piece triumph for Hannibal, with the general’s strategy even dictating the very choice of the battlefield itself. Cannae and its ruined citadel had long been used as a food magazine by the Romans with provisions for grain oil and other crucial items. Hannibal knew about this supply scope, and willfully made his army march towards Cannae (in June, 216 BC) for over 120 km from their original winter quarters at Gerunium. Interestingly, the camp of the Carthaginian army was just set above verdant agricultural fields with ripening crops – which could provide easy foraging to the snugly quartered troops. In other words, the chosen location and its advantages surely drummed up the morale of these soldiers, while strengthening their resolve and dedication for their commander. However at the same time, there was a more cunning side to Hannibal’s choice of Cannae – (possibly) unbeknownst to his army. That is because Rome was still dependent on the grain grown in native Italy (while seeking alternative corn supplies from Sicily), especially from the region of Apulia where Cannae was located. Simply put, the choice of Cannae was an intentional ploy to provoke the Romans to give direct battle – as opposed to the Fabian strategy of delaying. This once again alludes to Hannibal’s confidence and craftiness when it came to military affairs and logistics. In the previous entry we talked about the massive number of casualties suffered by the Romans at the Battle of Cannae. This automatically suggests the huge number of troops actually fielded by both the armies – with Polybius estimating around 80,000 Romans and 50,000 Hannibal-commanded soldiers taking part in the encounter (though modern estimates tend to lower these figures). Given such an enormous scale of the impending battle and the size of the approaching Roman army, many of the Carthaginian officers were clearly anxious about their numerical inferiority. One such officer named Gisgo even went ahead and voiced his uneasiness to Hannibal at the sight of the Romans (who were moving forward in tighter formations with greater manipular depths than usual). And this is where Hannibal’s greatest strength was revealed, and it pertained to his character. Instead of punishing or even rebuking Gisgo for such a demoralizing comment – especially before a battle, the general turned to the officer and perkily commented – ‘There is one more thing you have not noticed.’ When Gisgo asked, ‘What is that sir?’; Hannibal replied, ‘In all that great number of men opposite there is not a single one whose name is Gisgo.’ The nearby batch of officers wholeheartedly laughed with Hannibal’s retort – and the ‘infectious smiles’ were carried forth by even the rank-and-file soldiers, thus calming their nerves. Interestingly enough, it was the Battle of Cannae that was ultimately responsible for Hannibal’s unceremonious call back to Carthage (in 203 BC) after 15 years of remaining undefeated on Italian soil. In the post years of the Cannae incident, the Roman leadership came to a realization that they couldn’t counter Hannibal’s genius in conventional warfare. 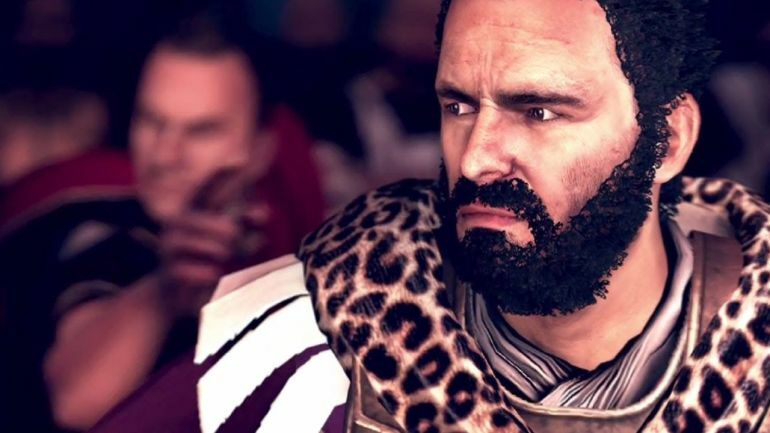 As a result, they reverted to the defensive Fabian strategy (named after Quintus Fabius Maximus Verrucosus) which basically entailed a guerrilla-warfare type scenario with internal lines of communications. In other words, the Romans rigorously avoided open-field battles, while resorting to hit-and-run and harassing tactics that afflicted the stretched Carthaginian lines and patrols who were regularly dispatched for foraging. This predicament was further exacerbated when Hannibal had to provide garrisons for the newly defected cities in south of Italy. This took away much of his precious manpower that had already deteriorated due to previous battles, skirmishes and attrition. Moreover, much of Hannibal’s army was composed of mercenaries of different nationalities – and they were neither suited to siege warfare or garrison duty, and thus many of them started to desert en masse. So slowly but surely, the once grand expeditionary force that made its way to Italy via the Alps, was now only a shadow of itself. By 203 BC, even chances of arriving reinforcements from Carthage or Iberia went slim, with both of his brothers being soundly defeated. And ultimately, Hannibal himself had to answer the desperate call from his own Barcid war party, which was one of the two major political factions of Carthage. So the general and some of his trusted mercenaries finally decided to set sail for Africa. And thus ended the epoch of Hannibal in Italy – paradoxically brought on by his incredible victory at the Battle of Cannae. The true genius of Hannibal was not confined to his generalship and strategies during war, but also defined his very character even during times of peace. In other words, the high level of education received by the leader in his younger days was revealed in full spades in the later years after the Second Punic War, when Hannibal the commander became Hannibal the statesman. Already claiming massive support on his return from Italy (and even after his defeat at the Battle of Zama), the leader was chosen as one of the two suffetes (shophet in Semitic), which gave him the rank of the chief magistrate of the Carthaginian state. By this time however Carthage was already stripped of its formerly mighty empire, and was in outstanding debt with the huge war indemnities to be paid to Rome. But the tireless Hannibal set to work by first successfully obtaining a revision in the constitution and then initiating an agreement condition that limited the power of the council (also known as Hundred and Four) with annual elections. The latter clause clearly curtailed the previously unchecked power of some council members who now couldn’t hold their offices for two consecutive years. Beyond politics, Hannibal also played his major role in administration by clearly revamping the state system, thus countering several acts of corruption, embezzlement and even unpaid taxes. All of these factors proved that a war indemnity could be paid without heavily taxing the general public. And was the case with Barcid ingenuity, he even trained many of his soldiers in agriculture. So the combined efforts in the fields of both commerce and agriculture – supplemented by Hannibal sweeping reforms, once again made Carthage prosperous. In fact, the levels of prosperity were reached at such an efficient rate that by 191 BC, the state was wealthy enough to pay its entire war indemnity of 8,000 talents (that was to be paid over a course of 40 years) in lumpsum. But given Rome’s preeminent position in the Mediterranean, they arrogantly declined the offer. 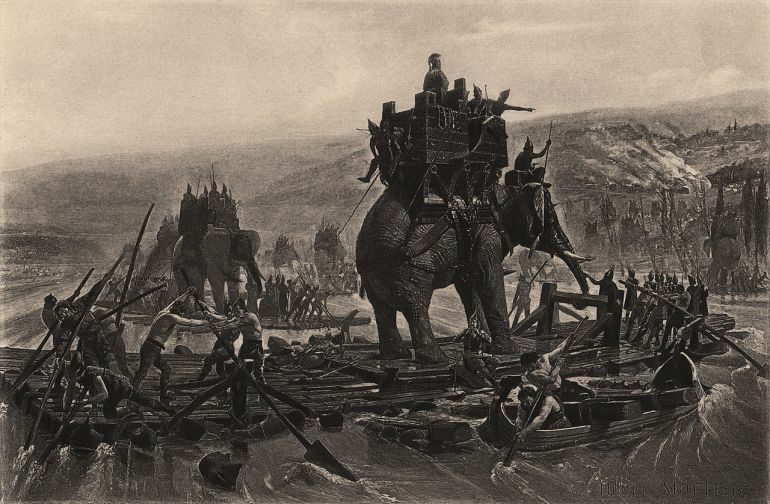 In any case, seven years after the Battle of Zama, Hannibal’s term as a suffete expired – and his position inside Carthage also became precarious. Firstly, this was due to the fact that he had made many enemies in the council, courtesy of the far-reaching political reforms. Secondly, and more importantly, by then Rome had become wary of Hannibal’s rising influence. Subsequently, the senate sent a Roman commission to Carthage on investigating a (possibly) made-up charge that implicated Hannibal on maintaining connections with Antiochus III of Syria – who was Rome’s foremost enemy in the Anatolian theater. Hannibal already knew of such a plan being hatched against him, and thus not trusting his fellow countrymen, he retired and inconspicuously made his very way to Antiochus’ court in Ephesus – as a challenge to Rome. Warfare and its degree of unconventionality – both these limits were put to test in battlefields by Hannibal Barca (and the opposing Romans) during his Italian campaign that lasted for fifteen years. But Hannibal had proverbial tricks up his sleeve even when he was pursued by his foes in his later years. 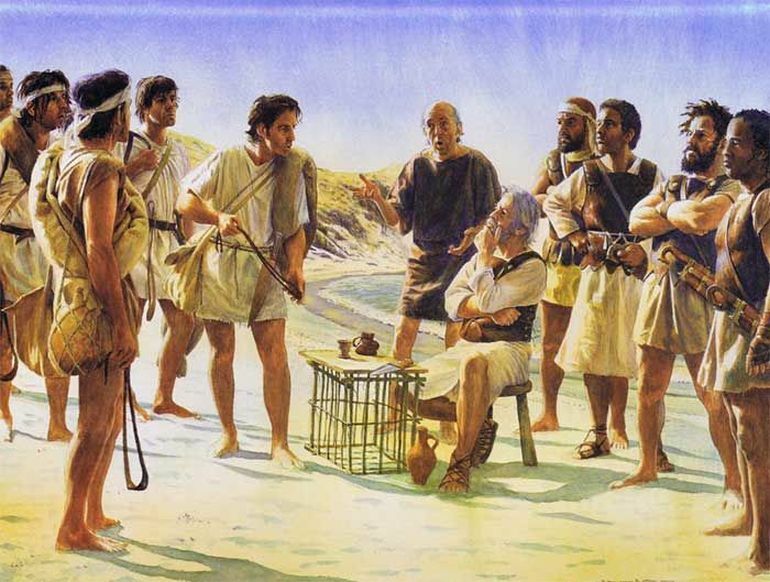 One such incident pertains to how as a last gamble, he sought refuge in the court of Prusias I of Bithynia, after the defeat of his longtime ally Antiochus III of Syria. The Bithynian king who was engaged in war with his rival (and Roman ally) Eumenes II of Pergamon, proceeded on to give Hannibal the charge of his entire fleet, after numerous reversals in land-based battles. And though outnumbered in ships, Hannibal devised a seemingly odd tactic which entailed filling up pots with venomous snakes. The unsuspecting sailors from Pergamon even jeered at the Bithynian marines for fighting with pots instead of swords. But once the pots were launched into the enemy ships, their boards were soon crawling with poisonous snakes of different varieties. 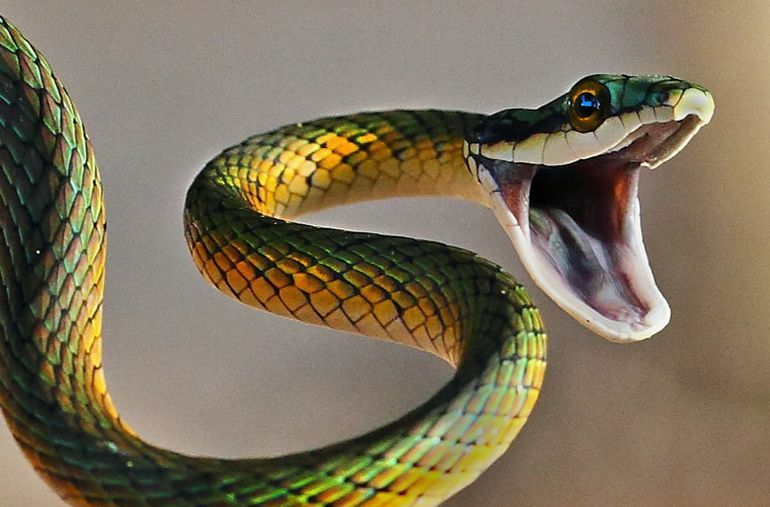 Now we don’t quite know if it was the psychological effect of such a demonstration or if it was actually the snakes themselves, but the tactic seemingly did yield victory for the naval forces of Bithynia. History is replete with examples and anecdotes of Hannibal’s generalship. But before he became the commander of the Carthaginian forces in Spain (and that too quite by chance, when their original commander Hasdrubal the Fair was assassinated), Hannibal was by all means an incredibly educated man. Some of this had to do with his closely supervised upbringing, especially since his father – the eminent Carthaginian leader Hamilcar Barca, was posted overseas in Sicily fighting the First Punic War against the Romans. The lack of such a father-figure at least in Hannibal’s initial boyhood days was made up for by the employing of famed Greek tutors. In fact, Greek military traditions (especially the exploits of Alexander and Pyrrhus) inspired the young general to such a degree that he even took his Greek tutors out on the military campaigns – like in the case of the Spartan historian Sosylos who accompanied Hannibal on his renowned expedition across the Alps. And furthermore, Hannibal’s Greek training was not just for show. The leader even in his exile after the Second Punic War, authored books in Greek, with one example pertaining to the campaigns conducted by his Roman foe Gnaeus Manlius Vulso in Asia Minor. It was written as a military manual for the defenders of Rhodes. Hannibal’s penchant for the Greek language was also evident from the engraving (in a lone Doric column) in both Punic and Greek, in the town of Crotone (southern Italy). Under his supervision, the artisans etched and documented his illustrious albeit ultimately unsuccessful Italy campaign.